Out of work and running out of money, private investigator and fraud expert Katerina Carter desperately needs more clients or she’ll be forced to go crawling back to a cubicle at her previous firm, a fate worse than debt. So when Liberty Diamond Mines CEO Susan Sullivan hires Kat to find Liberty’s missing CFO and a large sum of embezzled money, she’s eager to accept the job. But her excitement soon turns to terror when two company employees are brutally murdered. Kat realizes that this investigation is much more dangerous than she had ever imagined when she uncovers a sinister connection between blood diamonds and organized crime. She races against time to prove it—and stay alive long enough to expose the real criminals...or her first case might just be her last. "An international tale of diamonds, danger, and disappearance, Exit Strategy gripped me from page one." 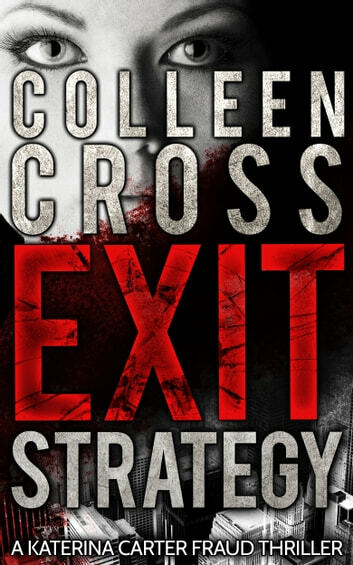 "If you like John Grisham and Michael Connelly, you'll love Colleen Cross's riveting page-turners!" A fast-paced read with a strong female lead. I 'd never heard of a forensic accountant before and found it quite fascinating how everything comes down to money in the end. And blood diamonds...This was an engrossing read and I couldn't put it down! I really enjoyed the action, thrills and the characters! Some good humor as well as a good storyline!! Well done! Enjoyable if improbable - the accidental heroine who when it gets tough becomes a wonder woman. It took quite a lot of suspension of belief to get into Kat Carter as a character but she is worth another go in the future. This book i found very jnteresting from the start to finish. The detail provided both in the location and plot kept one guessing throughout the book. The intriging plot regarding diamonds, money, cartels and thé intersection amont all tirée Will jeep you on thé Edge or your sweat. I love reading novels set in vancouver; unfortunately the main character is such a silly flake the whole plot becomes completely unbearable and a waste of time. this could have been a decent plot in the hands of a writer.